Mismanaged crises eat up valuable time, resources and money. Failed leadership leads to failed crisis management. Mismanaging crises can destroy lives, careers, employee morale and stakeholder trust – impacting organizations for years and even decades. This is the final part of a special 3-part series on effective crisis leadership and spokesperson skills. The intent is to help today’s leaders gain deeper insights into successful crisis leadership, spokesperson training skills and crisis decision-making, so they can increase their successes during challenging organizational crises. You will learn about five key, leadership filters that were instrumental to a successful crisis response when all hell broke loose for one Fortune 500 company. You can use this as your checklist to see if you share some of these same leadership characteristics, and it will provide you with a good idea of how your leadership style would impact your organization’s crisis response successes. The news headlines are filled with stories of failed leadership during crises – Uber, Facebook, Volkswagen, BP, The Weinstein Company (Harvey Weinstein), Takata, the NFL, United Airlines, Dupont, Bill Cosby, NBC’s Matt Lauer, Mylan and many others. This special series focuses on Jim Hart. Jim was the Vice President of Public Affairs for Texas Eastern Transmission Corporation (TETCO) when its large natural gas pipeline exploded in a highly populated neighborhood of Edison, New Jersey. 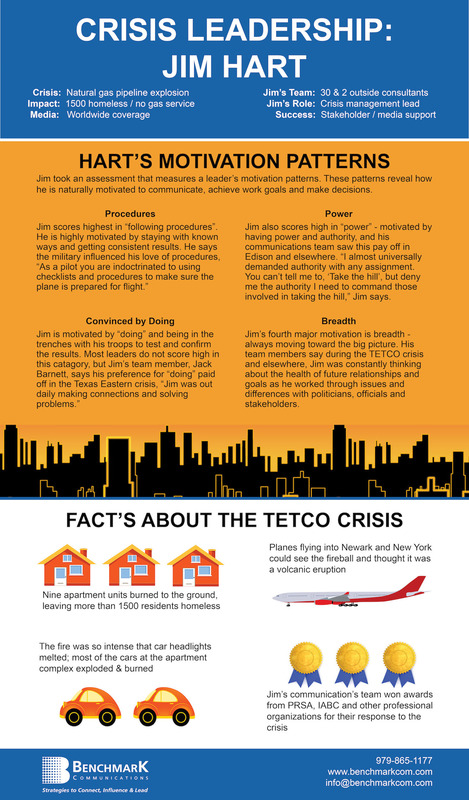 Jim led TETCO’s communication response, served as the key spokesperson and maneuvered to stop his company from getting entangled in legal battles in the immediate aftermath of the devastation. The incident left more than 1500 people homeless and community leaders initially assumed many had perished in the explosion. Jim’s team earned numerous prestigious PR awards for their crisis leadership, spokesperson skills and crisis communication strategies in the aftermath of the Edison incident. More importantly, TETCO earned the trust of the public, politicians and even the news media because of its spokesperson skills, stakeholder engagement and crisis communications strategies. For legal reasons, companies cannot always share the communication secrets and what they learn in the wake of a crisis, but time has passed and we reached out to those who led TETCO’s response. Jim is now retired to his family farm in Florida; he is active with charity groups and grows high-quality hay for area farmers. He also certifies pilots at a local airport and is on the airport’s Board of Directors. In addition, we got in touch with Jim’s key communication leaders in Edison. Today, Jack Barnett is Chief Communications Officer for the Harris County Appraisal Office in Houston. Keith Schmidt is a PR and Crisis Consultant with Benchmark Communications; he is also a guest journalism instructor at The University of Texas. George Spadora, who was Edison’s newly elected mayor during this pipeline crisis, now practices law in New York. Note: Did you miss Part I and Part II of Benchmark Communications’ series on Effective Spokespersons and Crisis Leadership? If so, we invite you to enjoy the full series, so you can glean ideas and strategies from the entire storyline. Jim Hart’s life was a complete set up. His experience and wisdom set him up to succeed as a media spokesperson and crisis leader when all hell broke loose after a major pipeline explosion in Edison, New Jersey. In the 1960’s Hart worked his way through college as a radio announcer in Florida. He later became a news anchor and news director in Dothan, Alabama where he covered the famous civil rights march led by Dr. Martin Luther King over the Edmund Pettus Bridge in Selma. He was a pilot in the US Air Force and later transferred to the Alabama Air National Guard. Along the way, he earned a law degree, was a lobbyist and a political campaign manager. Eventually, he headed up media relations and government affairs for Gulf Oil in Pennsylvania before joining Panhandle Eastern / Texas Eastern (TETCO) in Houston as the Public Affairs Vice President. On top of all of this, he was a Brigadier General in the U.S. Force Reserves. His experiences sharpened his crisis decision-making skills and made him a keen observer of human behavior, emotions and perspectives. His assortment of leadership skills, spokesperson skills and communication strategies paid off for TETCO when the company faced a devastating incident that left many homeless and attracted worldwide media attention. As part of this series on effective spokespersons and crisis leadership, Hart agreed to take a work motivation assessment that Benchmark Communications uses with Fortune 500 clients to advance their leadership development skills and capabilities. The iWAM assessment reveals how Hart is motivated to achieve work and project goals, and it helps to shed more light on why his crisis leadership style succeeded when TETCO faced this daunting crisis. (You can use this as a checklist to see how your leadership style might compare with Hart’s results.) Studies show that motivation accounts for up to 60% of a leader’s overall performance, and the iWAM measures dozens of Meta Programs – behavioral filters that that are out of your conscious awareness, yet impact your leadership style, daily thinking, actions and decisions. When leaders understand how these filters impact their thinking and actions, they can more effectively lead and motivate teams. Jack Barnett was TETCO’s Director of External Affairs during the New Jersey crisis, “Jim absolutely used his power to achieve our team’s crisis goals in Edison. It was obvious he enjoyed having authority and credibility with the top leaders in the organization and outside stakeholders, too. During a crisis, people want to know there is a point person who can get things done. Jim was that point person in Edison – from the Mayor, to the Governor, to our own leadership. That kind of personality is important in a crisis, and no one else could have done the job that Jim did,” Barnett says. Hart’s third highest leadership motivation score is “convinced by doing”. Effective leaders must delegate as they move up the ladder, and that is why many leaders learn to move away from “doing”. But, in the case of the Edison pipeline explosion, it was a blessing that Hart is highly motivated by “doing” and being in the trenches with his troops. Jim was a hands-on crisis leader and his team leaders agree they wouldn’t have had the success they enjoyed in Edison without his preference for “doing” and being actively involved in the daily response. “No one else could have influenced the Mayor of Edison like Jim Hart,” according to Barnett. “Jim is at ease developing relationships and he quickly connected with the Mayor and New Jersey Governor to ensure their needs were being met,” says Barnett. “Jim had the knowhow and talent to bring people together toward a common goal. He drew in the Edison Mayor and the Mayor’s staff to achieve a common goal,” Barnett recalls. “Jim also spearheaded relationships with many other stakeholder groups. Daily, Jim was out meeting with key players and members of the Edison community. He inspired confidence that we knew what we were doing and we would make things happen to take care of the situation and those impacted by the crisis,” Barnett adds. Jim Hart’s fourth highest leadership motivation score is “breadth”, and most successful leaders often score high in breadth. Hart is highly motivated by understanding and moving toward the big picture, and Barnett is not surprised, “Jim was always thinking bigger; he was thinking about how the company’s community relationships in New Jersey and elsewhere were going to look long after this crisis was behind us.” Barnett adds, “Jim took the same approach with the United Way in Houston where we were headquartered, and the United Way Director ended up playing a key role in the Edison response. Because of the Director’s connections all across the country, TETCO got much needed support from other New Jersey charity groups to assist those left homeless after the pipeline explosion,” Barnett says. “Jim never viewed our United Way relationship as just another charity donation; he viewed it as supporting important community causes and as a key way for our managers to make important connections. His ability to think bigger paid off for us in many, many ways in Edison,” says Barnett. According to the iWAM assessment, Jim Hart is also highly motivated by “group environment” – another important quality for most successful leaders. This means Jim is greatly motivated by working with and around people. Hart’s communications team had a lot of respect for him, because they always knew he had their back. While he was motivated by power, it was how he used that power at TETCO that made his team admire him and give their very best. Hart consistently used his power to gain credibility and respect for his team, and this allowed them to enjoy more successes than similar corporate communication teams. “What gave us the authority to lead the Edison crisis was the fact that the communications team had enjoyed so many tiny successes that made company leadership trust us and see us as credible,” says Hart. 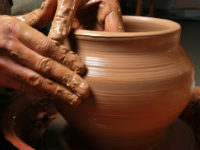 “We avoided failures and focused on those tiny, daily successes. By having lots of little wins, the company’s leaders trusted our communications team to handle a big crisis situation like Edison. They viewed us as confident and not timid. If you are timid in regular business times, your leadership will not listen to you in times of crisis,” Hart adds. “The real heroes in Edison were Jack Barnett, Keith Schmidt, Byron Burnett, Danny Gibbs and all the others in our communications group who worked tirelessly to satisfy stakeholder and media expectations,” says Hart. Jim Hart’s communication team always expressed great admiration for him prior to TETCO’s pipeline crisis in New Jersey. He held them to very high daily standards as they communicated the company’s stories, news and plans – and he always had their back. After the Edison crisis, they expressed even greater admiration for Hart, and his leadership motivation scores provide additional insights into how he was able to lead his team to win favorable media coverage and increased stakeholder trust in the midst of massive chaos. How a leader is motivated greatly determines how he (and his team) earns permission to be heard and trusted – in good times and during crises. If you would like to improve your team’s ability to earn stakeholder trust, advance your spokesperson skills or improve your leadership capabilities, contact us at Benchmark Communications. In addition, if you could be interested in taking the iWAM assessment to better understand your leadership style, we can help you with that, too. Benchmark Communications was honored to work with TETCO before, during and after the Edison crisis. TETCO’s PR leaders and crisis communications team were instrumental in creating a stakeholder-centric culture that was key to the company’s success in Edison. Their leaders also credited Benchmark’s leadership strategies, crisis management strategies, spokesperson training, media training and stakeholder communications training for contributing to their successful stakeholder and crisis response approach in Edison.